A big company, but one which spread its resources throughout the 8-bit platforms, never really dedicating to one platform, and consequently it was much respected, but never really had the image of 'belonging' to one machine, like Ultimate Play The Game (the speccy) and Superior Software. The games were good, the star programmers were undoubtably the multi-talented Peter Scott and the technically amazing Gary Partis. Audiogenic were orginally set up by Martin Maynard, and based down in Theale, Berkshire. This all changed when the MD of Supersoft - Peter Calver, bought a 50% stake in the company, and it became a different legal entity - ASL. For a while, the company stayed in Theale, and when Icon Software got into financial difficulties ASL bought the rights to all their games and oher assets such as the Newcastle-based development team, which included Gary Partis. Darryl Still ran this new 'arm' of ASL, heading up the northern development team, re-releasing some of the old Icon titles, and launching new projects with this team (Thunderstruck, Psycastria et al. ), whilst developing titles such as Ziggy from the berkshire based authors like Dean Lester. The joint Managing Directorship of Peter Calver and Martin Maynard was not a happy one, apparently both were very strong personalities and both wanted control of the company, and in the end, Martin Maynard sold out his 50% of the company to Peter Calver, and went to set up Maynard International and the budget arm of that company, Top Ten. ASL re-located to the old Supersoft offices in Harrow, London. Shark, Loopz and Helter Skelter are all titles developed in this phase of ASL's lifetime. By this time, the northern development teams contracts were all finishing up, so Gary Partis and Peter Scott and the rest all became free agents and went on to develop for other companies. Darryl Still (despite offers from both Calver to continue with ASL and Maynard to work for Maynard International) also left and founded his own label, Godax. A sequel to probably their most successful game, this is actually quite decent as sequels go, being set more in space than the original game. The graphics are less exciting though, but the gameplay is exactly the same. It scrolls along nicely, and is worth a play if you completed the original, first timers should head straight for number 1 though. 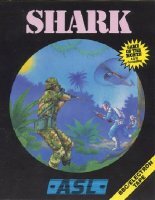 A cool shoot-em-up, by the man himself, Peter Scott! This is a brilliantly fun game, and brings something to the shoot-em-up genre, a really cool bouncing main character! You bounce along the landscape, and have to control where you land, whilst simulatneously shooting the hoardes of baddies. Your character fires in the four main compass directions at once, so timing is good if you want to kill those baddies you've already gone past! Superbly playable and great fun, Scotts individuality really shines through in this one. Above average shooting and running game. It is basically the same as Superiors Strykers Run, but with larger graphics and less detail. It is still a great fun to play game, and I suppose the layout is more inventive than in Strykers Run, it is definitly worth a play or two, or three! A fun game, in this you control a lunar lander, and have to dodge past the meteorites to land on the planet surface. Depending on where you land you get certain bonuses, such as x2 or x4. The graphics are nicely done, if a bit plain, and in high-res mode. A good extension to Lunar Lander. This is a great game to play, you are in charge of a little ball, and have to travel along the tracks, which are done in a great graphical effect, to produce an imense feeling of speed. It gets very hard, and you have to go slow sometimes, but it is really good when you are going around at high speed, it looks so good in full colour high-res! One weird thing is that when you get onto the high score table and have to enter your name, the cassette relay can be heard opening and closing very rapidly!! More of the same from Partis - it hardly needed a sequel, but its a good game, so we'll forgive him that. Another clone of Kix, the game where you use the laser cutter to remove portions of the screen. This is a very tedious version, and the graphics are done in low-res, and in this it makes everything look appalling. Definitly one of the worst versions I have ever seen of the classic game. The first of three arcade adventure games by Peter Scott, the author of Ricochet and Pandemonium for Superior. 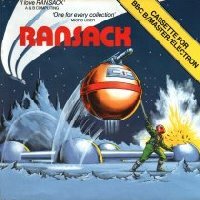 The game puts you in control of a spaceman, and you have to guide him around a castle, all done in lovely low-resolution graphics, collecting items and dodging the baddies, the eventual aim being to escape. It is very difficult, but enjoyable, and indicative of his work on computer games for the BBC. The worst of the three Thunderstruck games, I don't like this one because it is very hard to get anywhere, as there are too many baddies to dodge, and they get in the way. The main character is the same, but the game is this time set in some caves.